•Celebrate the 'Time of No-Time' with the Music of Ancient Future! East of the Sun Spied A.F.A.R. •First Studio Track Added to the Archive of Future Ancient Recordings! 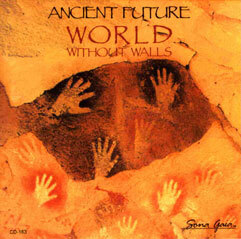 World Without Walls by Ancient Future. (Capitol/Sona Gaia 163). Signed Reconditioned CD - $24.98: Buy Link. >YTmusic. Celebrate the 'Time of No-Time' with the Music of Ancient Future! There's been much ado concerning the end of the current 5125 year cycle of the Mayan Long Count calendar on December 21, 2012. Legend has it that the first of seven Mayan prophecies refers to the last 20 years of this cycle (1992-2012) as the 'The Time of No-Time.' What more appropriate way to celebrate and shape the new era to follow than with the music of Ancient Future? With that in mind, Ancient Future announces the 'End of the Beginning' Sale. From now through December 21, a complimentary promo copy of World Without Walls by Ancient Future featuring the song 'End of the Beginning' will be sent to anyone who spends $51.25 or more on music from the Ancient-Future.Com store. Read more. Plus, the latest four Ancient-Future.Com releases are on sale. Just purchase any book, CD, or make a donation to support the Archive of Future Ancient Recordings, and you will have the option of purchasing any of the CDs below for only $11 each! First Studio Track Added to the Archive of Future Ancient Recordings! Recording Newsletter. $15 (receive 128 kbps downloads): Subscribe @ $15. Download Supporter. $25 (320 kbps downloads): Subscribe @ $25. Limited Edition CD Sponsor. $50 (all previous plus CD quality audio): Subscribe @ $50. Honorary A & R Representative. $75 (all previous plus video and 24 bit audio): Subscribe @ $75. The Archive of Future Ancient Recordings concept is to involve you, fans of world fusion music, in supporting the creation of a collection of new live and studio recordings that are available to subscribers as they are created. There are seven expertly mixed and mastered live tracks totaling 50 minutes and 42 seconds in the archive available to subscribers immediately! And we've just completed the very first studio track for the archive! 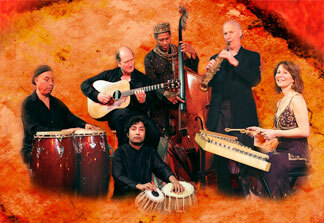 'East of the Sun' is a very poignant piece with an Afro 5/8 groove and a haunting melody. The basic tracks for this new composition by Matthew Montfort were recorded on April 1, 2011. The trio version featuring original Ancient Future tabla player Benjy Wertheimer, Mariah Parker on santur, and Matthew Montfort on scalloped fretboard guitar has just been painstakenly mixed and mastered for the archive! An alternate version was also recorded, and is now ready for overdubs by Paul McCandless on oboe and Kash Killion on bolong (a West African three string instrument with a calabash base). The basic tracks for two other tunes have also been recorded, including one featuring Vietnamese dan bau (a one string instrument with an indigenous version of a whammy bar) master Bui Huu Nhut. These have now been edited and are ready for overdubs as soon as the funds have been raised. To date, we've raised $2630 towards our goal of $25,000 for the project, and we are now just a few thousand dollars away from adding two more brand new studio tracks to the archive! Please sign up for A.F.A.R. now and help support the creation of this music. Live Concert Recording Session and Birthday Celebration! Mariah Parker's multi-faceted approach to music blends the driving rhythmic syncopations of Latin jazz, the uplifting spirit of Eastern music, and the soul of flamenco. 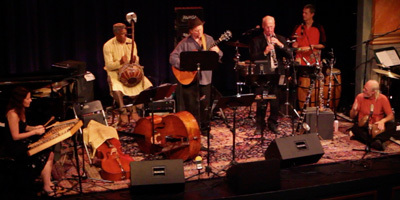 On the evening of January 20, 2013, Mariah and her world-class Indo Latin Jazz Ensemble collaborate for a live CD recording session at the Freight & Salvage, Berkeley's premier music performance space. That evening, the band will present enchanting new pieces Mariah composed for a live album following up on Sangria, her critically acclaimed debut release on Ancient-Future.Com Records. Plus, January 20 is Mariah's birthday, so join us in the celebration of her special day and the joy of musical creation in the moment. 60 Minute Skype Lesson: Sale -$60. Buy Link. Gift Certificate for Four 30 Minute Private Lessons (San Rafael, California): Sale - $140. Buy Link. Recently recognized as one of the world's 100 Greatest Acoustic Guitarists, Matthew Montfort teaches all styles of guitar (and other fretted instruments including ukulele, bass, and mandolin) along with music theory and repertoire for all instruments. He helps students reach their own personal goals in music, whatever they may be, through a lesson plan customized to the student's needs. He is now accepting a limited number of students at his studio in Marin County, California, and will travel to student's homes in the San Francisco Bay Area. Gift certificates for private lessons in Marin are available, and for online lessons worldwide via Skype. Montfort wrote the book Ancient Traditions – Future Possibilities: Rhythmic Training Through the Traditions of Africa, Bali, and India, which has been used by many musicians to improve their rhythm skills. Private lessons and online Skype tutorials covering this material are available as well. And for a limited time, an additional discount is automatically offered on a Skype tutorial with a book purchase through Ancient-Future.Com!